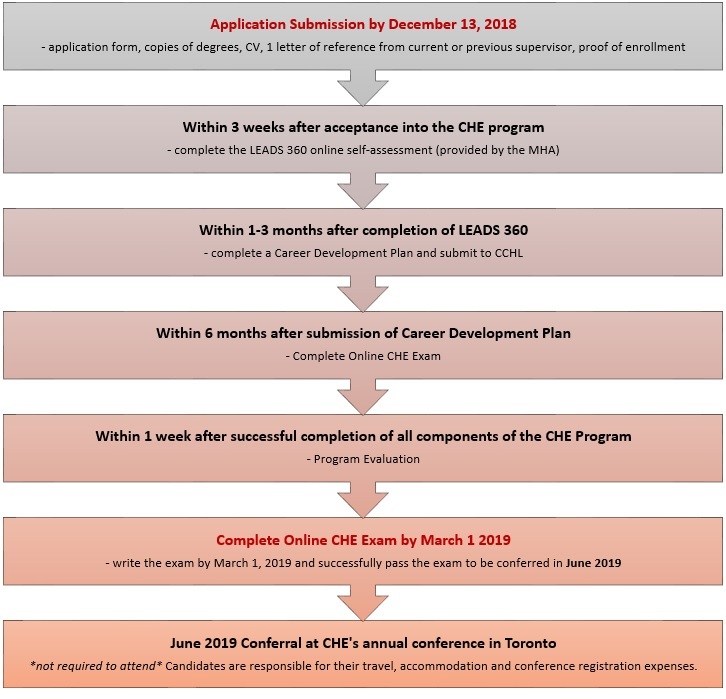 As the CHE program is self-directed, some students may complete the components much earlier than the given timelines. For example, as soon as students completed the Self-Assessment and Career Development Plan, they can start preparing for the online exam. Copies of degrees: if you are sending images of your degrees, please ensure the image is clear and the font is readable. Signed letter of reference from current or previous supervisor in employment context. Although the letter of reference is non-structured and is open to the interpretation of the referee, it should be structured around your skills and abilities in the areas of health services management & leadership as they relate to the CHE program. Completed application form + copies of degrees + CV with detailed position description + Signed letter of reference from supervisor in employment context.